It’s officially half a year since Christmas, and there is absolutely no sign of me missing glazed ham, pumpkin pie, nor cider. I mean, at the time, in the holiday spirit I did enjoy these things, but darling summer, who’s crept up on me as if playing hide and seek here in the Valley, has waved good-bye on my behalf, to all feelings for these beastly feasts. Suddenly, I find my heart skip beat as I stand beside my Vitamix, counting down the 30 seconds of waiting on my tomato and cucumber mocktail with plum salt. Suddenly, I find myself running six days a week instead of four. Suddenly I find my feet are three shades paler than my legs. However many changes there have been, one thing has stuck with me like the flaked-off remnants of beige nail polish; it doesn’t really bother you, it’s invisible to everyone around you, but once in a while when you sid down and have your coffee break, you realize “I should really do something about this..”. We all know how these things are sold – in econo-sized slabs. And I know all too well that my mother and I, two little women, will never maw our way through the two pounds of butter and sugar that went into that slab. Hence, for months, I’ve been walking past the chilled display case faintly aware of my numerous sighs. But then I found this recipe at Noms for the Poor and I thought, “My Daddy in Heaven you spoil me so much! 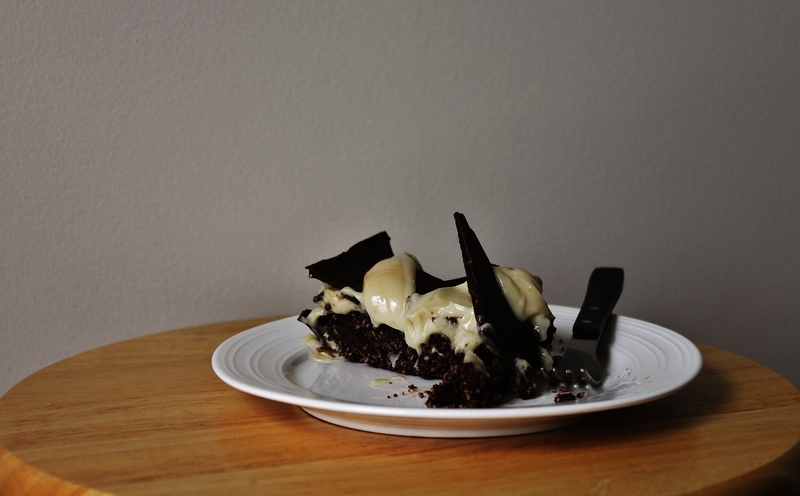 Even to a tiny little thing like my nanaimo bar craving you pay such close attention!”. To make the brownie base, line a square brownie pan with parchment paper extending over the sides. Put the almonds, coconut, and walnuts in the food processor and pulse until coarsely ground. Add the cocoa and salt, then continue with longer pulses until the mixture becomes a coarse sand. Add the dates and pulse until the mixture becomes a moist crumb. Press this mixture very firmly into the prepared pan and chill in the refrigerator for 4 hours, or overnight while you soak the cashews. To make the coconut custard, put all ingredients in the blender (I used my Vitamix) and blend, starting on low speed, then gradually increasing it to the highest speed. Use the tamper to press in any ingredients that are not getting whizzed up. When the mixture is completely smooth with a consistency of extremely thick sweetened condensed milk, scrape it oover the brownie base. Smooth it out with a spatula (an offset spatula is best for the job), cover, and chill for at least 4 hours to set. Melt the chocolate either in a bowl set over a simmering pan of water or in the microwave (which I do, I must say, and works every time). Spread the melted chocolate over the set custard layer evenly, with a spatula. Chill until hardened. Before serving, if you wand nice pretty slices that are cleanly cut on the edge, then freeze the nanaimo slab thoroughly. Lift the slab out of the pan by the parchment “handles”. Set it on a firm cutting board and cut it with a sharp, heated knife (turn on the gas stove and hover your blade just over the flames 8-10 seconds). You will need to wash and reheat the knife after a maximum of 2 incisions. Then, thaw the slices so the custard is not frozen, store the rest in the fridge. OR do as I did, and save yourself the hassle and just cut straight out of the pan. This will give you slices studded with broken chocolate shards and showcase the rich creaminess of the coconut custard. Nobody will ever guess that this glorious mess was vegan.